8 easily removable drawers mounted in full extension rails with bearing cage guidance. Central locking with a cylinder lock and fold-down key. Individual locks prevent inadvertent opening in transit. Topple-proof - it is not possible to pull out more than one drawer at a time. 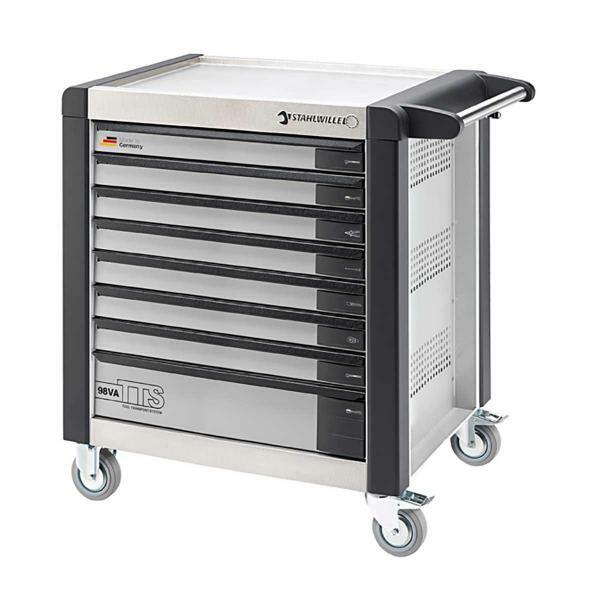 Drawers can be identified with multiple stickers per drawer(sheet of stickers included in delivery). Stainless steel handle with reinforced connection to body. Impact protection strips with wrap-around bumper. Wear and scratch-resistant worktop and ribbed protective base strip in stainless steel. Oil and acid resistant ball-bearing mounted low-friction wheels(ø 125 mm) with carpet protection to prevent ingress of dirt and fibres into bearings, with two parking brakes. 5 Standard colour shades, drawers in two colours (silver with black full-width handle). Perforations from both sides for Hooks No 8031-8041, e.g. for larger tools. Can be enhanced with STAHLWILLE Standard and TCS inlays.